This recipe comes from John Cunningham, who has made his own strudel for decades. The variations make both savory (spinach, salmon) and sweet (stone fruit, apple) strudel. All use breadcrumbs to absorb the juices exuded by the filling during baking. 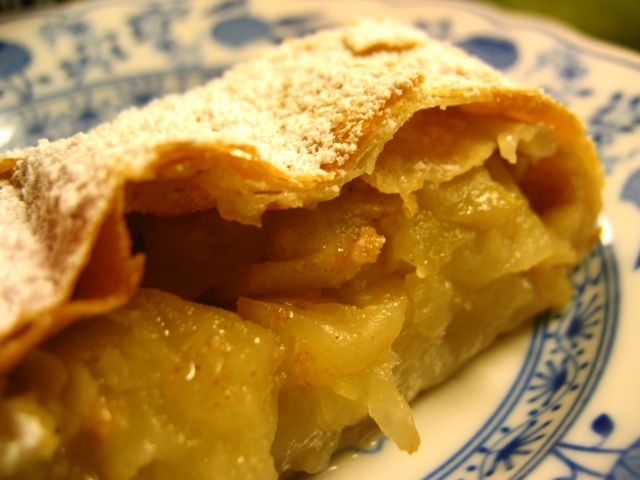 Read more about how to make strudel in "Strudel secrets." Combine the dough ingredients in a bowl (minus the 1½ sticks butter) and beat them together with a wooden spoon. Place the dough onto a floured bread board and knead for five to 10 minutes until you have a soft, but smooth and elastic, dough. Cover the dough with the bowl and let the dough rest for at least 30 minutes. Meanwhile, prepare the filling (see Note for variations). Preheat the oven to 450 degrees. Grease a large baking sheet and melt the 1½ sticks of unsalted butter. On a table covered with a densely floured tablecloth, roll the dough out into a rectangular shape. Using the backs of your hands to prevent the dough from ripping, stretch the dough into a larger rectangle until it is thin enough to read a newspaper through it, about 4 feet long by 3 feet wide. Brush the rolled and stretched dough with the melted butter. Along one end of the dough, over a width of about 6 inches, sprinkle some of the breadcrumbs. Place the filling ingredients on top of the breadcrumbs and sprinkle with the remaining breadcrumbs. Drape the short end of the dough over the mounded filling and, by gently lifting the tablecloth, roll up the dough, jelly-roll fashion, until the dough is completely wrapped around the filling. Curve the rolled strudel onto a greased baking sheet and brush it liberally with melted butter. Bake for 10 minutes at 450 degrees; lower the temperature to 400 degrees and bake for 20 minutes more, until golden to dark brown in color. Serve the warm strudel in individual slices. For fruit strudel, dust it with powdered sugar and serve the slices with whipped cream, if desired. Filling Variations Apple: Peel, quarter, and slice 8 large baking apples (4-5 lbs. ), such as Granny Smith, McIntosh, or Gravenstein. Mix the apples with 1 Tbsp. lemon juice. For tarter apples, sprinkle about 3/4 cup sugar over the apples when assembling the strudel; for sweeter apples, use 1/2 cup sugar. Use 1/2 cup breadcrumbs, 3/4 cup blanched and chopped almonds or walnuts, if desired, and cinnamon to taste. Apricot: Use 8 cups ripe apricots, quartered, as well as 1/2 cup sugar and 3/4 cup breadcrumbs. Cherry: Use 8 cups pitted pie cherries, such as Montmorency. Because pie cherries are tart, use 1 cup sugar, 3/4 to 1 cup breadcrumbs, and almonds and cinnamon, if desired. Plum: Use 8 cups quartered Italian prune plums, 3/4 to 1 cup sugar, 1/2 cup breadcrumbs, and cinnamon. Spinach-Feta: This is basically spanakopita; the Balkan version is called burek. Use 2 bunches fresh raw spinach, rinsed, dried, and chopped; 1 lb. crumbled feta cheese; 1 lb. (or a 15-ounce tub) ricotta cheese; 4 to 6 crushed cloves of garlic; 3 beaten eggs; and 1 large chopped onion. Mix the eggs, cheeses, and garlic together, then mix in the spinach and 1/2 to 3/4 cup breadcrumbs with your hands. Once baked, serve with plain yogurt. Gorgonzola-Kippered Salmon: Follow the Spinach-Feta recipe, but use 3/4 lb. crumbled Gorgonzola cheese in place of the feta and 1/2 lb. kippered or smoked salmon (don't use lox) in place of the spinach. Cut back the eggs to just 1 egg and use 1/2 cup breadcrumbs. Feel free to add 1 cup chopped walnuts, too.